Most people would reach for the perennial classic, linguine, when they are making a seafood based pasta however this recipe uses garganelli instead. Garganelli are small quills with delicate ridges which hold a rich creamy pasta sauce beautifully. I bought mine from my local Italian deli, Buongiorno Italia, which is a must visit if you ever find yourselves in St Albans- www.buongiornoitalia.co.uk. I challenge you to only buy what you intended in there and nothing more! 1. Start off by bringing a pan of water up to the boil and cooking the garganelli until al dente; drain well. 2. Whilst that is cooking away, take a large frying pan, heat to medium and add a glug of oil plus a knob of butter. Pop in the lobster tails, cover the pan with a lid and cook for a few minutes until tender. I like to baste the lobster with the butter whilst it is cooking from time to time too. Remove the lobster from the pan, allow to cool until you can handle it and chop the meat into pieces. 3. Using the same frying pan, add in the garlic and cook for a minute before adding the wine. Simmer and reduce the wine by half before adding the cream and saffron. Stir well to ensure the saffron colours the cream evenly. Season to taste before adding the lobster pieces back into the pan. Gently warm through and toss with the garganelli before adding a sprinkle of parsley. 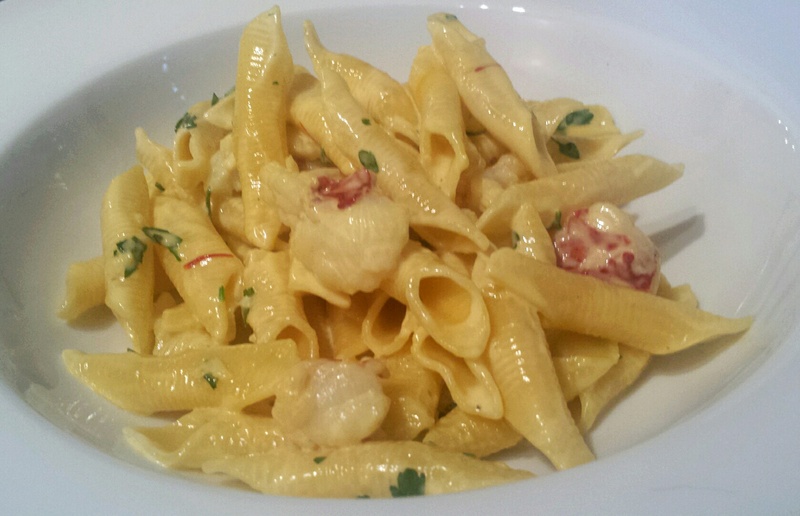 Lobster and delicate saffron cream garganelli- treat yourself to a little luxury!